Marker Tour F12 EPF Ski Binding Large 110mm Brake NEW 2017. EPF technology extends the downhill skiing ability of this exceptional uphill climbing product. The Marker Tour F12 EPF Ski Binding is ideal for touring-oriented skiers who want to cross over from resort skiing to alpine touring. The exceptional technology included in the Marker Tour F12 EPF Ski Bindings includes triple pivot toe, hollow tech, and Marker exclusive Backcountry technology. 110mm (90 and 136 available). Welcome to Alpine Sporting Goods! We sell brand new Volkl, Rossignol, and Blizzard skis at closeout prices. We also sell skis from brands like K2 and Line at our sister store AlpineShopvt. We have been in the ski and outdoor industry for over 50 years in beautiful northern Vermont. The item must be new, unused, in original packaging with all associated tags. 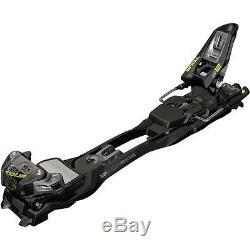 The item "Marker Tour F12 EPF Ski Binding Large 110mm Brake NEW 2017" is in sale since Wednesday, February 08, 2017. This item is in the category "Sporting Goods\Winter Sports\Downhill Skiing\Bindings". The seller is "alpinesportinggoods" and is located in Vermont. This item can be shipped to North, South, or Latin America, Australia.